Kager with some Sundown amps. Photos courtesy of Dennis Kager. 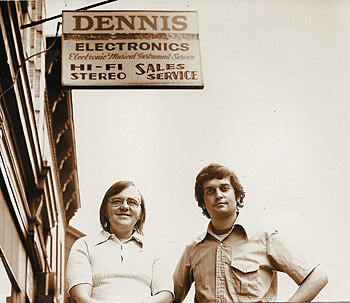 Dennis Kager and partner Dennis Bonk in May of 1973, outside of Dennis Electronics, Union City, New Jersey. His electronics background came via the Middlesex County electronics school, which Kager attended in 1962 and ’63. The school focused on vacuum tubes as they applied to television, radio and hi-fi. But Kager, of course, “gravitated to amplifiers” because his time playing music served as catalyst for his interest in the technical aspects of sound equipment. 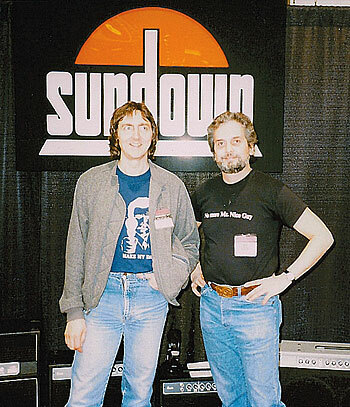 Kager with Allan Holdsworth in the Sundown Amplifiers booth at the ’86 NAMM show. 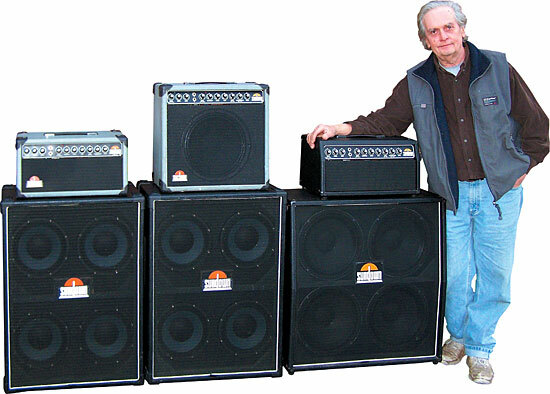 When Robbie’s Music asked Ampeg to service Fender amps, Kager started Dennis Electronics. 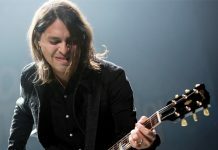 In no time, the new company was getting calls from Dorn and Kirschner, Muscara Music, City Music, Rondo’s, and other mom-and-pop music stores in New Jersey. Even after Kager made a clean break from the company in 1970, he continued consulting for a time, and the two have maintained a relationship through the decades. 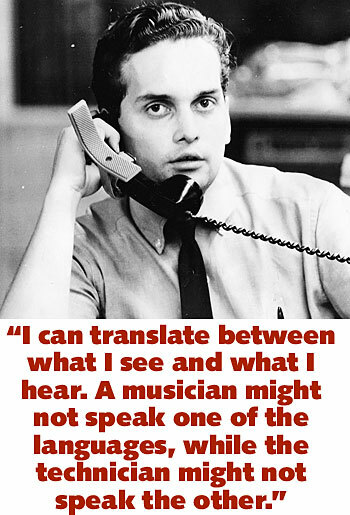 When he turned his focus to Dennis Electronics in ’67, several music-instrument dealers in New Jersey were so eager to have repair staff on hand, they offered Kager and partner Dennis Bonk free space to set up shop. 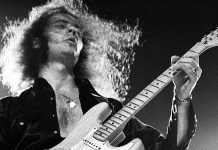 They chose a site on Washington Avenue, in Belleville, and used it until ’73, when they moved to Union City, a mile and a half from Manhattan, where the shop became the New York service center for Fender and CMI, Gibson’s parent company. 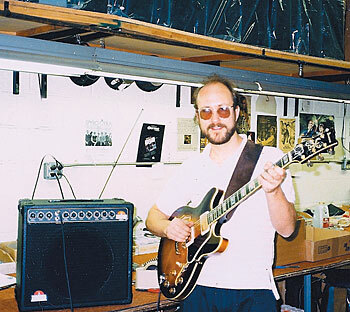 John Scofield in 1985 at the Sundown facility in Edison, New Jersey. While focused on Dennis Electronics, Kager developed a knack for keyboard setup, which led to a fortuitous encounter. 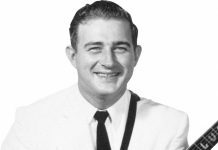 “I enjoyed working with Fender Rhodes pianos, and one day an older gentleman walked in and told me his name was Harold Rhodes. He said, ‘We’re starting to put pianos in classrooms, and we need somebody to maintain them.’ Fender wanted to have me open a school where people could learn to service the instruments.” To this day, Kager’s shop is one of two registered regional Fender service centers. In a few years, Dennis Electronics was a huge success. “When we moved to Union City, it really took off. All the big-name acts would go to Studio Instrument Rentals (S.I.R.) to rehearse and they’d send their equipment to us for repair. The roadies helped build our reputation. When a tour ends, roadies tour with other bands, and they’d bring that band’s stuff to us. So I always take care of roadies. The shop’s connection with S.I.R. Studios and Capricorn Records brought work with Southern rock bands, including the Allman Brothers. “We devised ways of making Marshall heads more reliable, and did little modifications like switching to more rugged tubes. We installed blow-out lights in the back of the heads so equipment managers could see from the back of the stage; if that red light came on, it meant the head had blown a fuse. Recently, Bruce Springsteen’s equipment manager brought in the Boss’ stuff for a tune-up. 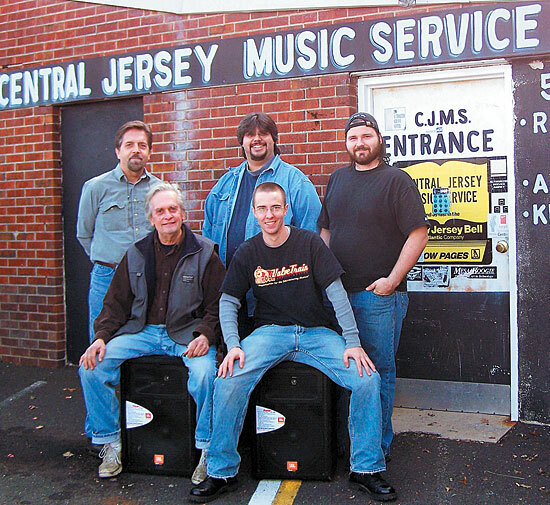 Kager (front left) with the staff of Central Jersey Music in October, 2008. Eventually, Kager got the itch to create his own, and designed a “working man’s” amp, capable of producing a range of tube sounds. He called it the Sundown Amplifier. “It was the first discreet channel-switching amplifier,” he said. “Any other amp that said it had channel switching really didn’t – it had layering. You hit a button and the amp layered an extra stage on top of a sound you already had. So my goal became to make an amp that had two true channels. I got a patent for a biasing circuit that allowed it to be manually adjusted from 100 watts down to 15, just by turning a dial. 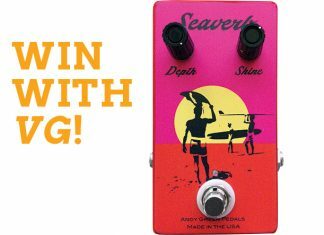 I also incorporated a governor circuit – a post-phase inverter compression circuit – as well as being a Master Volume so it could blend textures of overdrive. Nonetheless, the amp did see action with some heavy hitters. Eventually, Sundown developed other models. “As European distribution increased, we started making 50-watt amps, which Europeans preferred. 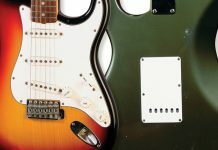 Sundown amps were well-received by the press and players, but Kager says by the late ’80s, the market for high-end equipment was shrinking. Eventually, he hit a wall. “I exhausted my funds – everything I’d gotten from the sale of Dennis Electronics, and then some,” he said. “Plus, I’d spent capital from friends who wanted to be a part of the company. 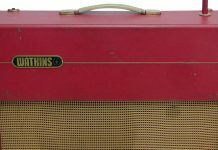 Hoshino started selling the amps for below cost in the U.S. and the only thing keeping me in business was the foreign market… and a Sam Ash store in Paramus, New Jersey. Deciding it was time to walk away, Kager sold his share of Sundown and took time off to work around his house. Within a few months, though, boredom set in. 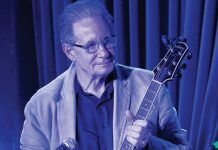 If one thing set Kager apart through his four-plus decades in the business, he credits being a musician for giving him insight, and an edge. For all of his achievements, Kager credits his success to the love, support, and help of his family. “I couldn’t have done it without my two wonderful sons, Denny and Tommy, and my brother, Johnny, who’s my right-hand man and has been with me from when I was playing in bands through Ampeg, Dennis Electronics, Sundown, now at Central Jersey Music.